Synway successfully implemented the migration of Alibaba’s customer service system from legacy TDM infrastructure to a complete VOIP system. The Synway SMG gateway and multimedia switch SPBX were selected to perform critical functions in the new enterprise network communication and enable seamless interconnection between communication system and business needs. Alibaba Group is world-class E-business titanic player headquartered in Hangzhou, China. Apart from traditional international trade platform, it also encompasses many other online trade platforms such as the well-known Taobao, TMALL, Aliexpress etc. For decades, Alibaba has developed and collaborated with billions of customers who calls for high demanding and high traffic customer services. Obviously, the legacy customer service system could not keep up with the booming business and longer and so need a whole new VOIP system to better interconnect with the current business platform and enable connection between SIP trunk and the legacy digital trunk, besides ensuring high efficiency and stability of the entire customer service system. The internal communication system stayed among the long-existing problems for Alibaba Group during the process of its recognizing as the leader of China E-business and offering almost everything with its almighty trade platform—Taobao. For the scratch, the group possessed over 300 branches across the globe and has established 5 branch offices in its headquarter—Hangzhou. How to communicate and associate with each other more efficiently and effortlessly in the group becomes the top issue. Secondly, the large scalability can never be ignored especially when the arising huge traffic and high density surging calls, which left the customer service system unreliable and the inside communication blocked frequently after the noted 11.11 event, with daily income calling of over 3 billion. The third key point is environmental-friendly issue. With a complex traditional communication system and independent branches, it would be a great waste to rebuild a new communication system and completely retire the old one, which undoubtedly is what the executives hate to see. Most importantly, the previous communication systems are still incompatible with current business platforms for both the legacy PBX-based communication devices and more than 90% of Alibaba businesses are adopting the mobile internet as the interface access. Therefore, the hard work for the executives is to find an appropriate way to integrate the communication system with its existing enormous business system. Early in the year 2010, Synway as well as its solution partner collaborated to build a dialing system, which is tailored to Alibaba’s needs and seamlessly interconnected with Alibaba’s platform, and it also features WEB Call, Network Callback, Network Fax, Group Call, Automatic Queuing, Load Balancing, Automatic Routing etc., and remain stable in high density calling. However, with the rapid development of Alibaba’s business over the recent years, especially the high-speed spread of the two giant trade platform—Taobao and Alipay, it becomes rather difficult for the previous communication system to catch up with various needs for booming businesses. Meanwhile, the leading VOIP technology is springing up and enjoys a wide range of applications and deployments. Alibaba hence introduced more applications like Mobile Internet Access, Data Infrastructure, Firewall, VoIP solutions and so on for its customers. 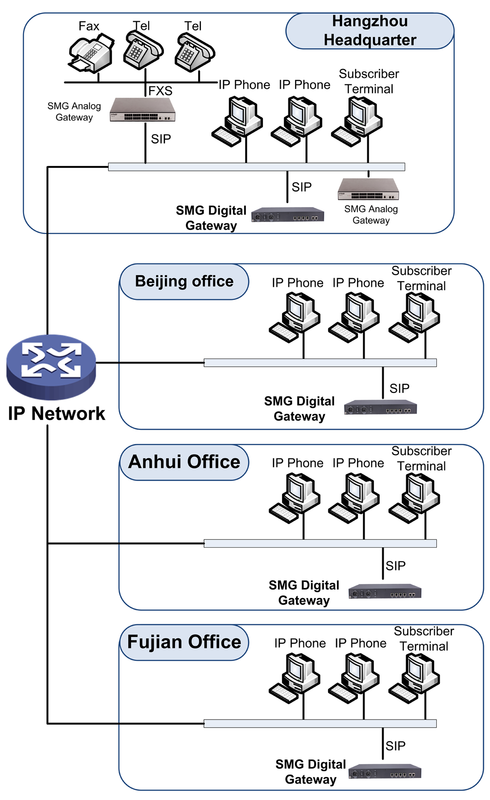 The VOIP solution Alibaba has chosen for its customers is Synway’s newly launched SMG Gateway combined with multimedia SPBX. The SMG Gateway features compact size in a 1 U chassis and can support up to 120-480ch concurrent calls. Besides high compatibility with hybrid digital trunk and SIP trunk interfaces, it also possesses standard Ethernet port and dual-power design for redundancy backup. The Synway Multimedia SPBX, on the other hand, proves to be good for the overall VOIP system for its integration with softswitch technology, featuring versatile characteristics such as high flexibility, programmability and unlimited scalability abilities. Supporting up to 20 E1 interfaces, the Multimedia SPBX is highly interconnected with various devices and allows for 30,000 IP access in a single machine. During the well-known 11.11 promotion campaign in 2013, it played a significant role as an efficient solution for high capacity surging dialing support for 100 million users. Above from the large capacities of 30,000 IP access, another vital part of the VOIP solution is that the SMG Gateway and Multimedia SPBX can be deployed seamlessly, with the benefit of centralized management. It greatly facilitates the whole deployment as Alibaba’s customer systems are distributed around the world – China and overseas branches. Therefore, to adopt a hybrid IP solution, i.e., a complete SIP-based solution was the most ideal choice for Alibaba Group. Alibaba used to ask Avaya for solutions, but it turned out to be non-customized solution and could’t integrate with Alibaba’s business platforms, besides high upgrading cost process. Under this circumstance, Synway’s technologies and services were chosen for its perfect convergence with Alibaba’s whole business platform and saved capital expenditure. With Synway SMG Gateway, the new Alibaba communication system could bring its customers total different communication experiences and effortlessly and efficiently introduce IP features. Thanks to Synway’s expertise in enterprise communications and the versatility of SMG Gateway along with Multimedia SPBX, Alibaba were able to complete the migration successfully within three months. The whole VOIP solution not only improved Alibaba’s entire communication architecture but also developed a new business model via integrating business processes with communication systems together, which allows its subsidiaries to open new business among virtual operators in domestic market.